Pop punk, pizza, fast food fans: I'm not sure if you're ready for this. Remember those pizza vending machines we told you about last August? Well, the time as finally come. They're getting shipped around the country soon. Yes, the Pizza ATM is a pizza vending machine, delivering fresh pizzas to its happy and hungry customers. Paline, a European Company, created this wonder. 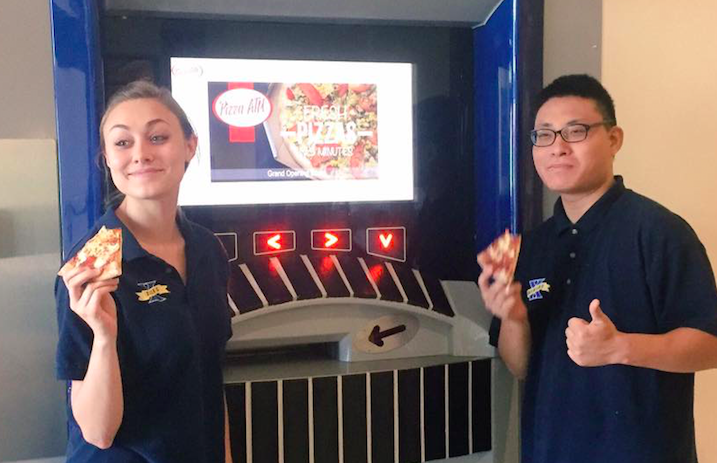 The Pizza ATM made its debut at Xavier University in Cincinnati, Ohio. Since it premiered, businesses and colleges around the country and Canada wanted their very own Pizza ATM. Earlier this month, Grub Street reported that the ATMs could ship as soon as January. Here's how it works: Pizza dough is stored in a refrigerated section, and when an order is place, the dough is moved into an oven. After three minutes, it's popped in a box ready to go.